An inner-city council that spent more than $500,000 fighting the East West Link has given an Australia Day citizenship award to the protesters who campaigned against the dumped toll road. Yarra Council awarded the protesters a citizenship award at its Australia Day ceremony. 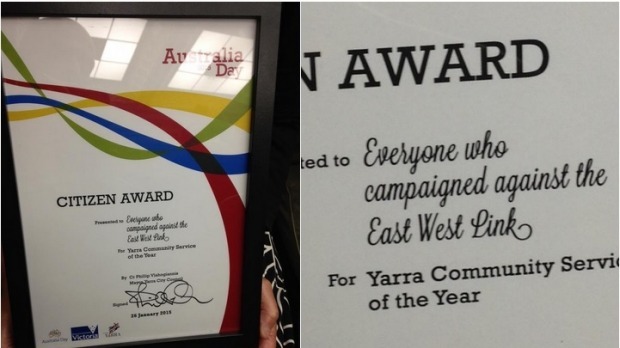 The Yarra City Council has given an Australia Day citizen award to “everyone” who campaigned against the $6.8 billion East West Link. The grassroots campaign against the proposed road tunnel – the first stage planned to connect the Eastern Freeway with City Link – involved a number of community groups and individuals united under the slogan “Trains Not Toll Roads”.